Hatched on Planet R-bit (officially Planet R.ib.bit, third planet on the left from Xerbix 319) Kricky The Alien Frog is one of one zillion-gajillion frogs hatched at the Frogatorium Emporium. One day, a war broke out when a strange metallic beast with a broken heart landed on Planet R-bit, but Kricky had a sneaky suspicion this Broken Heart Robot wasn't a threat to his planet, so he hopped aboard the robot's ship (more like stowed-away!) and traveled thru two whole solar systems before they crash landed on a tiny little planet known as Earth! 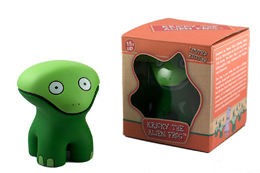 Kricky The Alien Frog - 3 1/2 Vinyl Figure with Removable Head and Windowed Box Packaging - NEW! Shipping and Handling costs will be calculated when you are ready to checkout. Most of these are already close to selling out, so make sure to get yours soon! We accept credit card payments through PayPal, but a PayPal account is NOT required. Payments will be made payable to our parent company Genshi Media Group and the invoice will show as "Kricky The Alien Frog - [with the item number]". The Kricky The Alien Frog character was conceived and designed by Craig Anthony Perkins, a musician, photographer, designer, author and toy maker. Craig is the founder and creative director of GENSHI:TOY a division of Genshi Media Group. 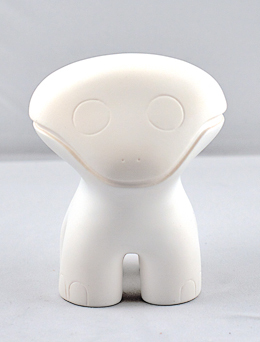 Kricky The Alien Frog is manufactured by ThreeZero in Hong Kong. The final product is a 3 1/2 inch vinyl figure with removalable head and windowed box packaging. 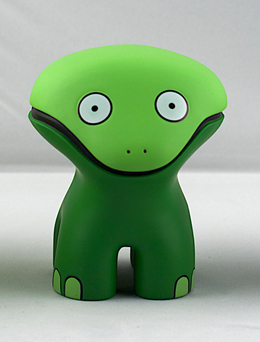 Order Kricky The Alien Frog Here! Choose your favorite Kricky below!